Novomatic have made one other slot game that’s quite like Stein Haus. This other video slot is: Freibier. Do you like sausages? Do you like beer? Do you like big wins? Then Stein Haus is your game! There are 5 reels and they are in a traditional Bavarian restaurant. Built out of wood, this restaurant is known for its sausages and beer! Bavarian beer is widely considered to be the best beer in the world. There isn’t just one type of Bavarian beer. In fact, there are almost 50 different types! Along the same lines, Novomatic are known for making some of the world’s best slot games. That makes Stein Haus the perfect combination of two world-class things! Although all Novomatic slot games are good, there are a few which players single out as being their definite favourites. Players favour: Dolphin’s Pearl Deluxe, Lucky Lady’s Charm Deluxe and Book of Ra Deluxe. Like these games, Stein Haus gives Free Spins. All of the settings are found underneath the reels when you are playing this video slot on desktop. Using the buttons at the bottom, you can spin and stop the reels; turn auto on and off; gamble or collect wins; adjust your bet and open the menu. In the menu, you’ll find the settings, help, information and the paytable tabs. The paytable explains all of the rules of the game, including the rules of the bonus feature and how you get payouts. In Stein Haus, you must spin at least three-of-a-kind for a payout. 4-of-a-kind wins pay more and 5-of-a-kind wins give the maximum payouts. 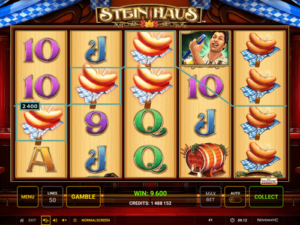 Stein Haus is quite unusual for a Novomatic slot game because it has 50 paylines. Most slot games don’t have this many paylines, so you’ll be chuffed to know that there are so many ways you can win. A payline is a line that goes across the reels, following a certain path. The paylines in Stein Haus go from left to right. The first symbol inovomatic n a win must land on reel 1 and the rest of the symbols must land on subsequent reels, without a gap, until at least three are following one or more paylines. If there’s a break in the chain, the Wild symbol can step in! The Wild symbol is two big jugs of beer and if this symbol lands in the gap, it will act as a substitute. The beer cannot be a substitute for the bonus symbol (or for happiness!). Now, to the symbols. Do Bavarians like to play card games? Who knows! Casino players do, though, and that’s why you’ll see some card values in this slot! Lots of slots have card value symbols, especially those made by Novomatic. In Stein Haus, the card symbols are: 9, 10, Jack, Queen, King and Ace. In addition to these symbols, there are some other symbols which are more Bavarian. You’ll find: the sausages, the keg of beer, the waiter and the waitress. Both the waiter and the waitress are dressed in traditional Bavarian clothing. The last symbol in this video slot is the bonus symbol. The bonus symbol is the Stein Haus logo with a banner reading the word ‘bonus’ underneath. 3 bonus symbols award the minimum payout, that’s equal to 2x your bet. 4 bonus symbols award a payout equal to 20x your bet. 5 bonus symbols award the maximum payout, which is equal to 200x your bet! In addition to the relevant payout, 3 or more bonus symbols gift you with 10 Free Spins. All Free Spins in Stein Haus are played with the Moving Wilds feature. This feature involves huge jugs of beer! 3 massive jugs of beer, to be precise. Each big jug of beer will take its own reel. Throughout the Free Spins, these big jugs of beer will remain on those reels, moving up and down. The whole jug covers two positions on a reel. However, it doesn’t always remain in full view. Sometimes the jug will go up too high or down too low, and only cover one position on its reel. There’s an extremely extraordinary win you can get in this Bavarian video slot. During the Free Spins, the big Moving Wilds can help you get this win. The special win is worth multiple times the normal payline wins. Every time you get a win with the Wild symbols, the beer jugs will cheers to celebrate. Imagine seeing every symbol on the reels doing this and then paying you a massive win!